Rainie has always been a dabbler, a girl that doesn’t have a singular “passion” the way her best friends do. Her feelings of inadequacy and doubt are given voice in a monologue delivered by drama heartthrob Tuck, and the instant connection she feels with him spurs her into finding a way to change her summer plans to be closer to him. But when she starts working as a cast member of the summer show he stars in, Rainie discovers that things in the drama world can get very complicated very quickly. 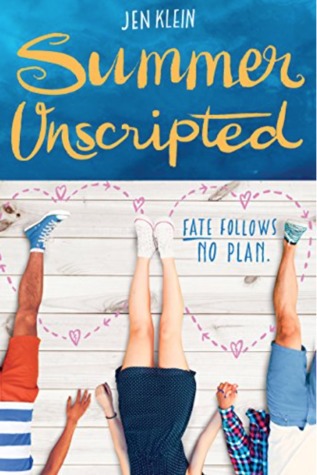 I fell head over heels in love with Jen Klein’s debut novel Shuffle, Repeat last year, and I spent much of my formative years as a theater kid, so to say that I had high expectations for Summer Unscripted is an understatement. It sounded like a YA contemporary that was written just for me, and it admittedly delivered in many ways – the depiction of theater life onstage and backstage, the magical feeling of a life-changing summer and the romantic comedy of watching Rainie get into all sorts of hilarious hijinks. So, why didn’t I love this one just as much as Shuffle, Repeat? I just didn’t particularly like Rainie, which resulted in a lack of a personal connection to her, which is always something that affects the overall way I feel about a story. Don’t get me wrong – I empathized with her at many points, and I could mostly understand where she was coming from. But she and I just never clicked the way I wanted us to. I felt like I was a bystander watching her story from very far away, and that changed the way I perceived the story overall. Would I recommend checking out Summer Unscripted? I would, particularly if you’re looking for a fun, fluffy YA read to take along on your summer vacation or a beach day. It certainly is no Shuffle, Repeat (and if you haven’t read that one yet, you should definitely go with this one first), but nonetheless, it is guaranteed to be an amusing way to pass a couple of hours.